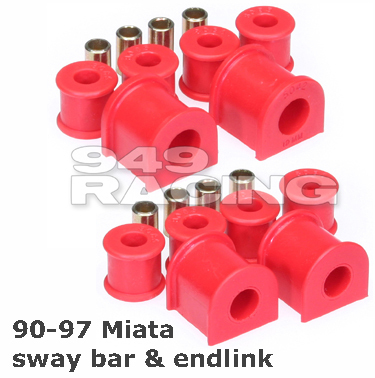 Energy Suspension bushings @ 949Racing - Miata Turbo Forum - Boost cars, acquire cats. Thanks go out to Bill Wilner for starting the ball rolling on this application a long time ago! 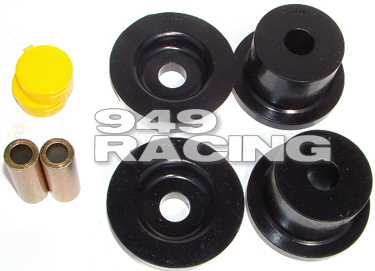 emilio, can you extoll the virtues of the energy suspension brand urethane bushings over other brands? perhaps you've seen the cheap bushings threads here. Mostly I care about control arm bushings (NB) but the details of everything else may be useful for everyone. My first sets are due in shortly. I'll test and report. Black and red are the same material, just dye. Ordered a durometer to compare to the SP's. The split bushings wil be easier to install. I've personally been using ES stuff for over 20 years and it's always been a positive experience. Based on that and a long conversation with their head engineer yesterday, I decided to add them. Overall, ES has proven much easier to deal with as a company than SP. When I asked SP about motor mounts, they said no emphatically. ES has a set in the works. When I asked SP about rack bushings for the NB, they said maybe. ES is scheduled to have them in the next few months. When I asked SP about improving their alignment correction bushings they said, "nothing wrong with them and FM hasn't had any problems". ES said, "we will take this opportunity to come up with a new alignment correction design for all applications". ES makes their own proprietary urethanes from scratch in their one facility. Some fairly exotic stuff for non-automotive applications. So no specific details on the kit yet, but I really like the company and that matters to me. With the offset drilled sleeve (vs. bushing)? That was obviously never thought out nor tested. I DID test one and it doesn't work. I can't believe it was ever produced. oh hey back up a second, i was confused. i was thinking this was more superpro details. i didn't realize you added energy. but now that you sell both, a comparison is very cool. btw, isn't the exchange rate with Aus going to hurt SuperPro's pricing structure here? Trying not to bash the SP alignment correction but yeah, it's uh, not the ideal design shall we say. They also knurl the end so the subframe can grip them. Problem is the knurling reduces the height around the perimeter of the end face. This means the only part contacting the subframe is the small crescent of the original face leftover after knurling on offset bore. So their attempt at inceasing the friction actually reduces surface area and friction. The other issue that SP had no answer to when asked, was how in the heck you are supposed to keep the offset pin oriented during installation and then verify it's still right after pushed into the subframe. Crickets.. Overall, I am quite happy with the SP standad bushings. They are super high quality and work beautifully. Just not happy with supply chain issues and engineering choices for the alignment correction kit. The engineers at ES had a few ideas on it but it will require a rethink entirely. Any new design will be based on the same symetric pin as the standard kit but with an offset bore bushing. The trick is keeping the bushing from rotating and thats where the new design comes in. I thought that the black had graphite impregnated? how off base am I? I believe I answered this question already? Black and red are the exact same material, just dye. Ok I went and found where I saw the reference. Maybe you should check your facts. You may have answered it, but I believe you are wrong. Energy Suspension ® red and black polyurethane components? Answer: Both are our Energy's HYPER-FLEX™ performance polyurethane formulations. Energy has impregnated selected black polyurethane components with graphite–to add a lubrication property. Additionally, both Energy Suspension ® red and black polyurethane components are engineered differently than OEM rubber components–to be free a floating and non-binding design. This allows for the additional durometer (firmness) of the components, which adds to the performance improvement of the vehicle overall. Through its 25 years of design and formulation of polyurethane, Energy's polyurethane components are the best on the market today. I sat in a meeting with their head engineer Don Ham yesterday. I asked him quite specifcally what the difference was and he said there was none. 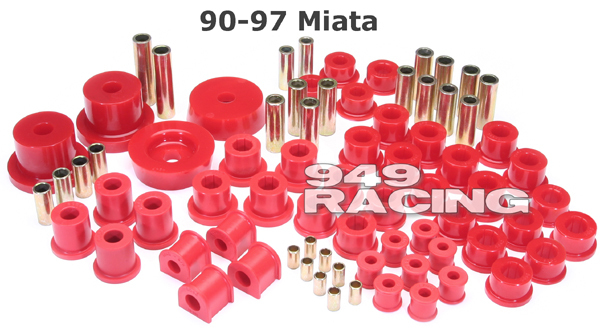 His answer was that for the Miata application both the red and black have the exact same material and graphite content. So either he's wrong or the guy who wrote the ad copy is. Your guess is as good as mine. The key word in the ad copy is "selected". As in, "Energy has impregnated selected black polyurethane components with graphite..."
However, this is the first time anyone has claimed that the 90-97 Miata bushings were not impregnated with graphite. The Miata kit is graphite impregnated. i know this is a stupid question with a stupid answer, but who cares what color the bushings are if they are the same material? tell them to add MoS2 (molybdenum disulfide) instead. The FAQ on their site does indeed conflict with what Don told me so I'll get a clarification. Thanks. The graphite issue was what I was referring to in post #3.